Toxic couches, a Northwest burn doctor, and fire science. Editor’s Note: We’ve said it before: California’s 12-second rule, a state flammability standard for foam-containing furniture, induces manufacturers to load their products with chemical flame retardants. It’s a stupid rule: it contaminates tens of millions of homes across North America with toxic substances — compounds that spread, harming people and animals. Of all the toxic industrial compounds in your body right now, a substantial share are flame retardants that came from foam furnishings — probably a larger share than any other category of industrial compounds. In other words, the 12-second rule is printing out, right now, in the chemistry of your body. But the rule has no compensating benefit for fire safety. The 12-second rule does not save lives in fires. It is useless. That’s what the scientific evidence says. This rule is all pain, no gain. But in April 2011, a California senate committee voted eight to one to sustain the rule, rejecting the Consumer Choice Fire Protection Act. Eight to one! Liberals and conservatives united to oppose a mild reform that would have allowed manufacturers to satisfy either the unchanged 12-second rule (exposing foam to a candle flame for 12 seconds without it igniting) or a different flammability test, one that relies on the best fire science. What convinced them? We suspect it was the tens of millions of dollars chemical manufacturers spent on lobbying and campaign contributions. But let’s give the legislators the benefit of the doubt. What might they have heard that swayed them? Sightline Intern Valerie Pacino, a Master of Public Health student, has investigated. She watched every minute of public testimony on the bill (here at 01:18:45 and here) and read all the statements pro and con entered into the official record. She found surprisingly few arguments voiced in support of the 12-second rule and an avalanche of arguments against it. You might think adding slow-to-burn compounds to upholstered furnishings, the largest single fuel load in many homes, would be a worthy precaution, a defense against house fires, and a lifesaver for thousands of people. It’s an understandable assumption, an intuitive one. Though Dr. Heimbach never questions or even explicitly mentions this assumption, it lurks beneath the surface of what he argued in Sacramento. So I checked the science. Dr. Babrauskas concluded, “It is important to emphasize that the above findings have not been disputed…Thus, the evaluation of the fire safety benefits of [the 12-second rule] is simple—there are no benefits.” Remember Dr. Babrauskas’ scientific conclusion as we examine key parts of Dr. Heimbach’s impassioned testimony, point by point. Dr. Heimbach is right: few of us are going to get burned up with a cigarette in bed, but the reasons for that have nothing to do with the 12-second rule. The rule provides no protection against mattress fires, not merely because, as Dr. Babrauskas says, it has “no benefits” for fire safety but because the 12-second rule doesn’t cover regular mattresses at all. (It does cover foam crib mattresses.) The flammability standard for mattresses is entirely different. The Consumer Product Safety Commission approved a tough national standard for mattresses in 2006, one that does not encourage use of flame retardants. It relies on effective fire-slowing design and flame-resistant fabric barriers. Additionally, cigarette fires in general are diminishing in frequency. According to the US Surgeon General, cigarette use has declined dramatically since the 12-second rule was enacted, and self-extinguishing, fire-safe cigarettes are now legally required in all 50 states. Smoke detectors, unlike the 12-second rule, save lives. The Centers for Disease Control and Prevention notes that over one-third of home fire deaths occur in homes without smoke detectors. While the flammability standard for furniture has no benefits, smoke detectors, fire-safe cigarettes and candles, child-resistant lighters, and sprinklers prevent fires and save lives, all without flame retardants. Dr. Heimbach assumes that the 12-second rule provides a safety backstop for families too poor to benefit from smoke detectors, but it does not. The 12-second rule confers no fire safety benefits. To protect those Dr. Heimbach serves, he should be supporting efforts to change the 12-second rule, such as those of the Consumer Product Safety Commission. The Commission has developed a superior national standard for furniture, one that, like the mattress standard, does not encourage use of flame retardants. Progress at the Commission is stalled, despite the strong scientific evidence in support of the new standard. Presumably, the same chemical companies that have lobbied in California also influence the Commission. Most flame retardants, at least the halogenated compounds used in mass-produced foam furnishings, are toxic chemicals: they harm living things, including people. The Environmental Protection Agency has listed various flame retardants as likely carcinogens. EPA has also linked these chemicals to liver, thyroid, and neurodevelopmental toxicity. Behavior changes are observed in exposed animals, and IQ scores are lower in exposed children. Research from the National Institutes of Health tied exposure in women to infertility, and exposure in men is associated with waning sperm counts. NIH is also pioneering research on the microbiome, and the interaction between the trillions of microbes in your gut and the pounds of flame retardants in your home may even play a role in the epidemics of obesity and diabetes. EPA’s Center for Environmental Research and Children’s Health is tracking how adverse health consequences are amplified with prenatal exposure to flame retardants. The toxic pathway of flame retardants in foam is rarely through a fire. Usually, they crumble out of foam into house dust, where children and pets roll in them, and everyone breathes and ingests them. They also escape from buildings, dust bins, dumpsters, garbage trucks, dumps, and sewage systems, working their way into food webs that span the planet. They also make the fumes of fires more toxic than they would otherwise be. This is one reason that fire fighters overwhelmingly support reforming the 12-second rule. The main reason fire fighters want to ditch the 12-second rule, though, is that it provides no safety benefit. All it does is insinuate millions of pounds of toxic chemicals into built and natural environments each year. An unimaginable tragedy — for this baby, for her family, and for her community. But what lesson should we take away from this heartbreaking story? Clearly, the fact that the mattress complied with the 12-second rule did nothing to prevent this needless death. Pillows have never been subject to the 12-second rule, but Dr. Babrauskas’ careful review of the literature finds no evidence the rule would have helped even if the pillow had complied with the rule. Yet a legitimate, science-based fire-safety standard — one that applied to both the crib mattress and the pillow — might have spared this child’s life. This girl’s senseless death offers no reason to retain the 12-second rule and every reason to replace it with a standard that actually works, and that applies to both crib mattresses and pillows. “No benefits” means that the medical bills of burn victims are unaffected by the 12-second rule. With it or without it, the bills are big. Without it, however, people would not endure the costs of toxic chemicals. How many people suffer diminished cognitive function, infertility, obesity, or cancer as a result of exposure? What hospital bills do these patients rack up? California is the only state that employs the obsolete 12-second rule. Because the state’s market is so vast, people throughout North America are effectively governed by it. If the 12-second rule saved lives, abandoning the rule might be considered “going downhill.” That must be what Dr. Heimbach believes, because he assumes the 12-second rule protects against fires. If, however, the 12-second rule has no benefits — as fire science says — then reforming California’s rule would be going uphill, toward a safer future. Pt. 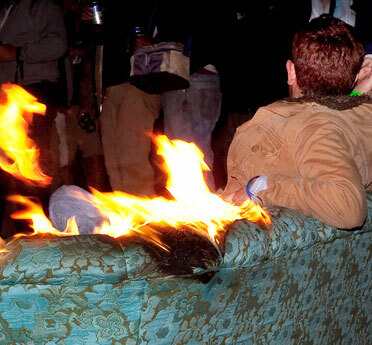 5: Have Toxic Couches Finally Met Their Match? Photo courtesy of Ecobalanza, a Cascadian company that makes furniture without chemical fire retardants. So fascinating and so much (all of it, in fact) information I didn’t know about! Thanks for sharing, Valerie! Keep up the good work. How many jobs do you propose are an acceptable loss in making these changes because you’re calling for the death of an industry? Does the author, or anyone else, have any speculation as to why a respected and revered academic would so blatantly undermine his own professed interests of keeping people safe? Is the implication that he is misguided, or something more sinister (i.e. paid)? I would really appreciate it if Sightline would pursue his response with vigor. Thank you for this analysis, Valerie. I am intrigued by this research, I’m staying tuned! A much needed perspective. Regarding the question of jobs lost – apparently not many. There are currently three FR suppliers providing products for use in California TB117 furniture. Their chemical offerings are broad and the lost of a one industry segment will not put them under. In fact, they have commented that the furniture business was not large enough to justify development of new molecules. Instead, PBDE FR replacements were found among other existing FR products used in apparel, PVC, wiring insulation, adhesives and coatings. They may have new trade names, but it is the same old chemistry. If replacing PBDE wasn’t worth the effort to create new and better products, then the fear of losing an industry and related jobs wasn’t all that great. So, as with so many alarming environmental issues, we’re convinced there’s a problem that needs to be solved. What course of action can we take to affect change? Is there a petition or lobby group that we can work with to overrule the 12 second rule? Ian, it is frustrating, but we’re eager to see what comes out of this legislative session in California. The Green Science Policy Institute (http://greensciencepolicy.org/) has been spearheading efforts to repeal or amend the 12-second rule. We’ll keep you posted on progress there. I am curious about off-gassing from soft foam mattresses. We have one of those memory foam products. I contacted Costco from whom I purchased the product and never received a response. Sometime around last Christmas one of the network news shows trodded out the seasonal fire safety report where they set a room on fire to show how fast a fire can spread. One of the statements I remember was that room fires were much worse today (both in speed and intensity) then they were in the past because so many of the furnishings were made with synthetic materials (I assume petroleum based). In the old days furniture was constructed with cotton and other natural materials (dare I say even hemp!) Buying sustainably produced furniture made with natural materials may not only help the environment but maybe save some lives. Thanks to Ken Bosworth & Mary Hofle for supporting a sustainable Northwest.